With the IG1 terminal voltage at 9.5 V or higher, the sensor power supply voltage decreases for 0.5 seconds or more. 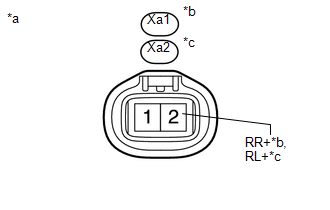 DTC C1407 is for the rear speed sensor RH. DTC C1408 is for the rear speed sensor LH. Normal (there are no momentary interruptions). 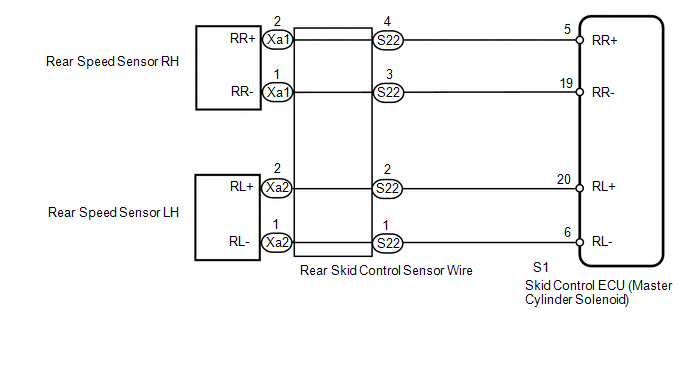 (a) Install the skid control sensor wire. (b) Disconnect the S1 skid control ECU (master cylinder solenoid) connector. (c) Disconnect the Xa1 and/or Xa2 rear speed sensor connector. (a) Disconnect the Xa1 and/or Xa2 rear speed sensor connector. (b) Connect the S1 skid control ECU (master cylinder solenoid) connector.